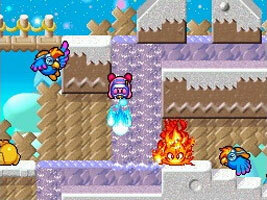 An expanded remake of Kirby Super Star for the Nintendo DS. While the main game is the same, it features many new game modes. Revenge of the King is a harder version of Spring Breeze, Meta Knightmare Ultra lets you play through the main games as Meta Knight, Helper to Hero is an arena battle where you play as Kirby's Helpers, and The True Arena is a much harder challenge mode. There are also more multiplayer modes and minigames to play. During the Megaton Punch minigame and King Dedede battle, on the left you can see Mario, Peach and Toad, and on the right you can see Wario and Luigi. When Kirby uses the Stone ability, he may randomly transform into a statue of Kine, Rick or Coo, the three animal helpers from Kirby's Dream Land 2. During the staff roll for Milky Way Wishes, Kirby appears standing next to a statue of Mario in the lower-left corner of the touch screen. During the boss battle against Kaboola, he fires bullets with faces, similar to the Bullet Bill enemies from the Mario series.